Last week I had a rough week. It was rough enough to affect my appetite… I didn’t eat much at all. Not that that’s a problem. Fasting is valid, after all. But it also gave my body a chance to ‘re-set’ (that’s part of the fasting science too, btw). But really, it all boils down to Self Control. And I have that in large doses in some ways, and not – it would seem – in others. I wasn’t sure how I’d go back at work. But fortunately, I was stationed on an espresso machine, so there was no direct temptation. On my lunch break however, I didn’t go anywhere near the refrigerated cabinet in the dining room: I simply pulled my homemade fare from the communal fridge and ate my healthy stuff. This was the third day since my ‘meltdown’. The next day was significantly more challenging, since I was stationed in a food outlet. Chocolate, cookies, chips staring at me all day. But….. NUH! My Willpower had well & truly kicked in. I was not going to have (added) sugars. And I have stuck to this. I knew, I know, if I make one slip, it will open the floodgates… and there’ll be no turning back. I recall one particular experience that really rammed this home to me: a friend had given me a block of Cadbury chocolate as a gift, even though I had some of my homemade raw dark chocolate in the fridge. Deciding to have “just one” row of the Cadbury, I returned to my desk. But within 3 or 4 minutes, I was back at the fridge & into the block again. This happened 3 more times. On my fourth visit to the fridge, I opted for a piece of MY chocolate (I usually make it with a very small amount of organic maple syrup)… and the craving instantly ceased. There were no more trips to the fridge. The biggest surprise – which is not really a surprise at all – in this ‘Sugar Reset’ I’ve experienced, is the sudden and obvious aversion I now have to sugary foods. In just 3 to 4 days, I have re-sensitised my tastebuds to Sweetness. I’ve had this experience before, but each time it happens it blows you away at how intense the changes are. The first moment I noticed it this time around was when I made some ….chocolate. I have a favourite recipe for Salted Caramel chocolate that’s sweetened only with dates (it’s a Thermomix recipe by Jo Whitton, the link to her blog Quirky Cooking is here) so I figured I’d allow myself to make some of that if I was permitting myself to eat whole fruits. But for a little variety, I also made some totally sugar free dark chocolate (literally just cacao powder & cacao butter) and created some chocolates that combined both of the flavours …like Cadbury’s ‘Top Deck’. The ‘shock’ came when I ate one of the plain Salted Caramel choccies, followed by a combined one. I preferred the latter. I preferred less sugar. 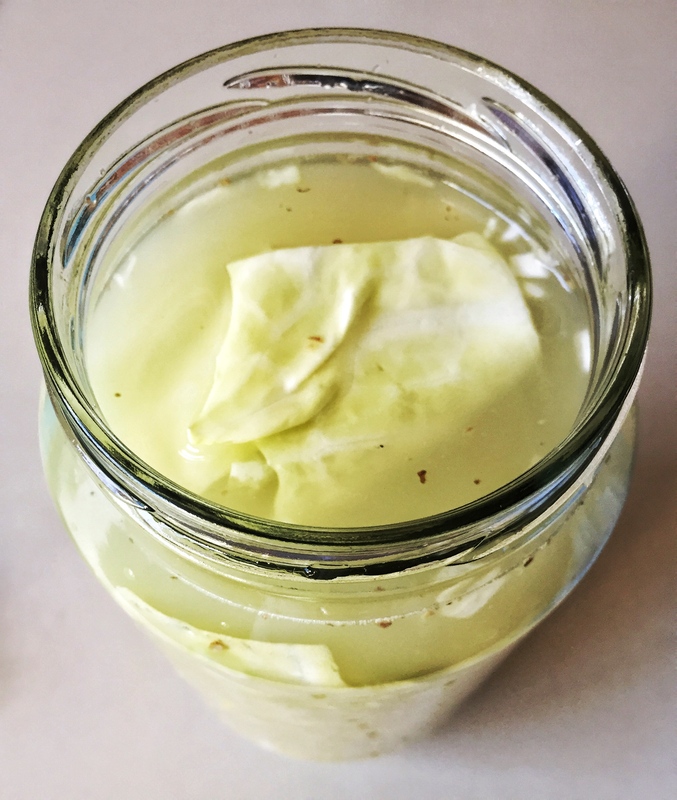 I noticed it in more subtle ways as well: I made vanilla custard minus the maple syrup I usually add on top of the sugar-laden vanilla paste, and it tasted just fine. I actually felt a little ill when I made roasted pumpkin soup because the sugars caramelised in that naturally sweet veggie during the cooking process, then intensified in the thick, creamy soup. I’m even eating less whole fruit. Now that’s saying something! The truth is, to truly give up sugar, we really need to discipline ourselves and restrict ….just for a very short period of time. Your body needs the chance to de-sensitise (and you will notice the difference). Think of your body as a spoilt child… when is the right time to finally say No? It was one of those days. I had no ideas, no incentive to cook, but I had heaps of veggies I felt compelled to use up. Nothing even remotely appealed to me in the pages of recipes I scrolled through on the net. All I knew was that I couldn’t use the oven because it was just waaaaay too hot. I vacillated between Thermomix and slow cooker recipes but the slow cooker won in the end, simply because I knew I could leave it on overnight. A lot of slow cooker recipes are deceiving in that they’re not just one-pot: many require you to pre-cook some of the ingredients. To a lazy cook like me that just doesn’t make sense. I want to throw everything into the crockpot at once, put the lid on and walk away. So when I found a recipe that fit the bill on Voracious Veggie‘s website (direct link below) I proceeded to adapt it… just by adding more stuff, really. 1 tablespoon extra virgin olive oil (EVOO), 1 diced onion, 1 finely chopped garlic clove, 1 small diced carrot, 1 teaspoon dried oregano, 1 teaspoon cumin, ½ teaspoon chili powder (double this if you actually want to taste it! 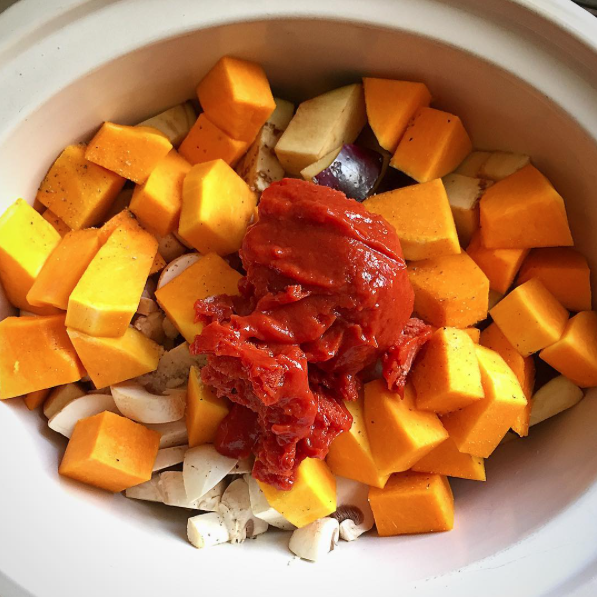 ), ½ teaspoon paprika, ½ cup tomato paste, 1 cup vegetable stock, 8 mushrooms sliced, 1 small eggplant (cubed), ¼ butternut pumpkin (peeled & cubed), salt & pepper. Pour the oil into the slow cooker, adding the onion, garlic and carrot, followed by the rest of the herbs & spices. Mix in the tomato paste & stock next, then add the mushrooms, eggplant & finally the pumpkin. Season with salt and pepper. Cook on low for at least 8 hours (I left mine on overnight… a total of 14 hours!) You can stir it up every now & then if you like. 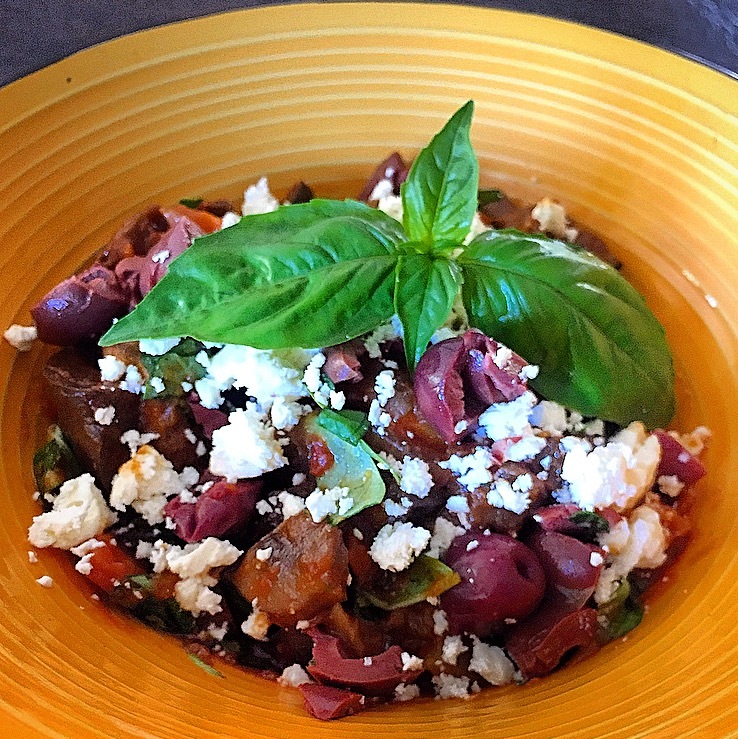 For my first meal, I mixed through fresh basil leaves, then topped the lot with chopped kalamata olives and crumbled feta (see left). Deeelish. For the next serve, I popped a piece of grilled wild salmon on top of a plateful. 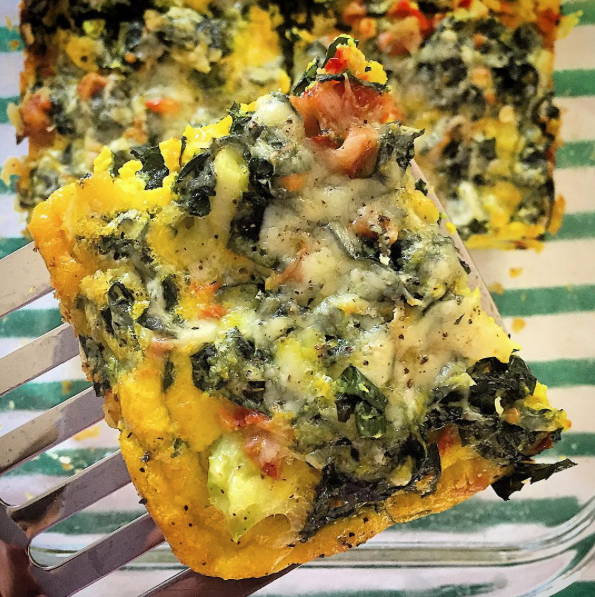 Frittatas are so. damned. easy. to make. You can put an amazing array of stuff in them (which in turn further inflates their nutritional value) and even better, they can be eaten cold as a healthy snack on-the-run. (They even freeze well …. even though I’ve never tried… coz I eat ’em too quickly!) Apart from the baking time, they’re pretty quick to prep. 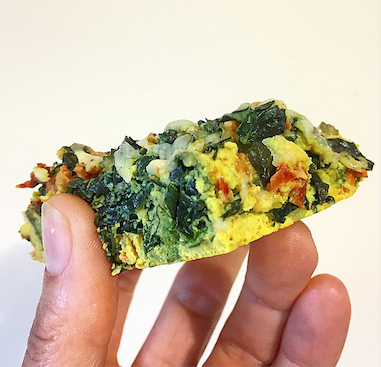 125gm broccoli florets, 100gm finely chopped kale leaves (if you find kale too strong in flavour you could easily substitute with spinach) 40gm finely chopped sundried tomatoes, 6 eggs, 1 (heaped!) tablespoon of freshly grated turmeric (you could use the powdered stuff, and less of it, if you’re not as fanatical about it as I) salt & black pepper (important inclusion to help your body receive turmeric’s power) 40gm grated cheddar (or parmesan if you prefer) plus extra for topping. Pre-heat the oven to 180ºC, grease (I use EVOO, that is extra virgin olive oil) and line a shallow baking dish with baking paper, set aside. The broccoli can be laid in the bottom of the baking dish immediately. Then you need to squeeze excess fluid from the kale. You could do this by hand (clean hands of course!) but I use paper towel so that I don’t lose any of the green to my fingers. Now, I opted to spoon the solids (the kale, tomato & cheese) into the baking dish, to fill in the gaps between the broccoli florets … I guarantee if you try to pour the whole mix out you’ll end up with a pile of vege in one spot! Call me OCD, but I’m fairly sure it’ll cook better if the liquids & solids are evenly distributed. I dribbled the remaining egg mix evenly throughout the dish as well. The final step is to grate however much extra cheese you want, over the top of the entire dish then whack it in the oven for 30-40 minutes (just check it at the half hour mark: when it appears quite solid in the middle, it should be ready). 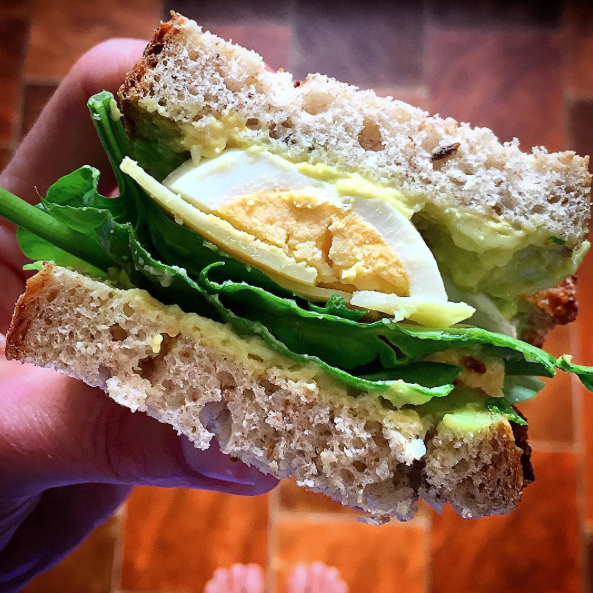 All I used was: 2 slices of rye sourdough (a fermented, flavoursome bread) 1 boiled egg, ¼ of a large avocado, 3 think slices of parmesan cheese (you could use any hard cheese but a sharp flavoured one will taste better) & a handful of baby spinach leaves. Because I keep my bread frozen, I had to thaw them in the toaster …which gave me time to peeled the shell off the egg. Then it was a super simple assembly: avo spread thickly over both pieces, egg slices and laid on one, topped with the parmesan cheese (at this point you could, if you wish, chuck this under the grill to melt that cheese …mmm…) then carefully laid baby spinach (OK, OK, apart from sounding highly OCD, this actually helps you to fit more spinach on the sanger, so it’s less likely to fall out when you eat it. Uh-oh, another OCD statement…) Salt if you prefer, then pop the second slice on top, avo face down (did I really need to spell this out?) and Bob’s your uncle…. 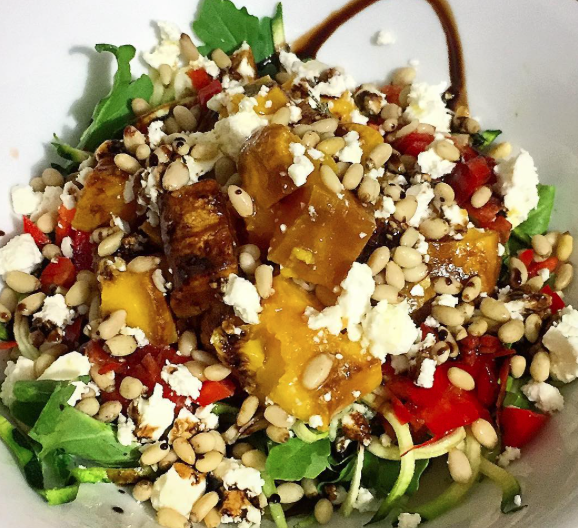 a delicious, healthier, more nutrient-dense version of an old favourite. This creation was the result of a respiratory infection. I’ve been working too much – around too many people – so my stressed immune system has given way to a lurgy. A fellow workmate made me promise to get some ginger and turmeric into myself when I got home… trouble was, I wasn’t really hungry. So I did a quick Google search for “ginger turmeric vegetarian recipes” and when I struck upon a cauliflower soup recipe, the light bulb came on. Garlic, chilli, ginger and turmeric pretty much speak for themselves in terms of health benefits: everyone knows about them now, so it’s probably quite obvious why included them in this recipe. Coriander’s detoxifying role is lesser known by many, and the benefits cumin and fenugreek bestow on the respiratory system are pretty much a secret! Since I was highly disinterested in expending a great deal of effort to cook, I turned straight to my Thermomix. 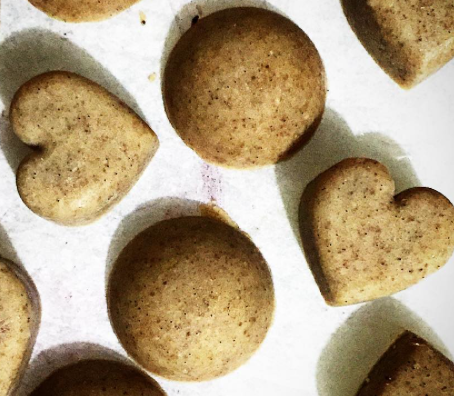 They really are the best things to have in the kitchen when you lack time, energy and/or motivation. (This is not intended as a sales promotion, it’s my truth!) So please note: even though I’m providing a manual method for this recipe, you have to forgive me if it’s not what you expected because I’ve literally created this soup one time, and using my wonderful kitchen appliance. Pop the garlic, fenugreek, roughly chopped onion & celery, ginger and turmeric in the bowl and set to Speed 5-6 for up to 10 seconds. Scrape down then add the coconut oil, cooking for 3 minutes on Varoma, speed 1. Add the coriander, cumin, chilli, cauliflower, water and stock paste, seasoning with the salt & (lots of!) pepper. Cook for 18 mins on Varoma, Speed 1. Finally, add the coconut cream then blend 60 seconds speed 9-10. Pop a large saucepan or stockpot on the stove over a medium heat and add the coconut oil. Roughly chop the garlic, onion, celery and tip into the pan/pot. Grate the ginger & turmeric fingers straight into the mix and toss in the fenugreek (you may want to employ a mortar & pestle to grind these little fellas down…) ground coriander, cumin and chilli. Cook for a few minutes, until the spices are fragrant and the veggies begin to soften. Add the cauliflower, stock and season with salt and black pepper. Bring to a boil, then drop back to simmer for about 10 minutes. 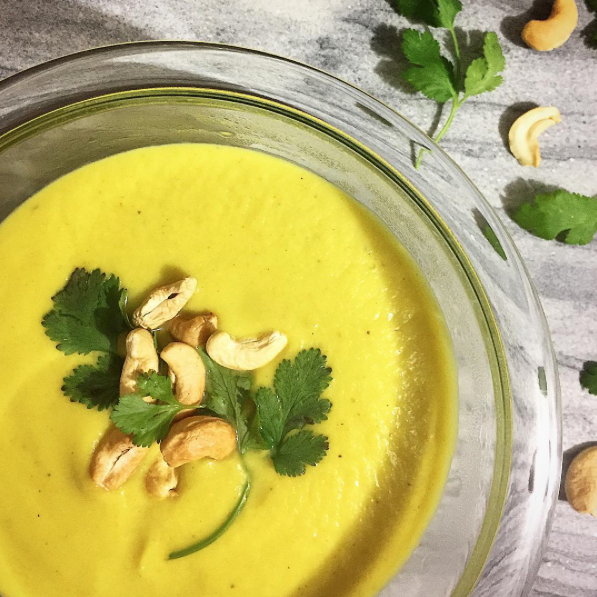 I had just roasted some cashews so garnished my soup with them and some fresh coriander. Just what the ‘doctor’ ordered! 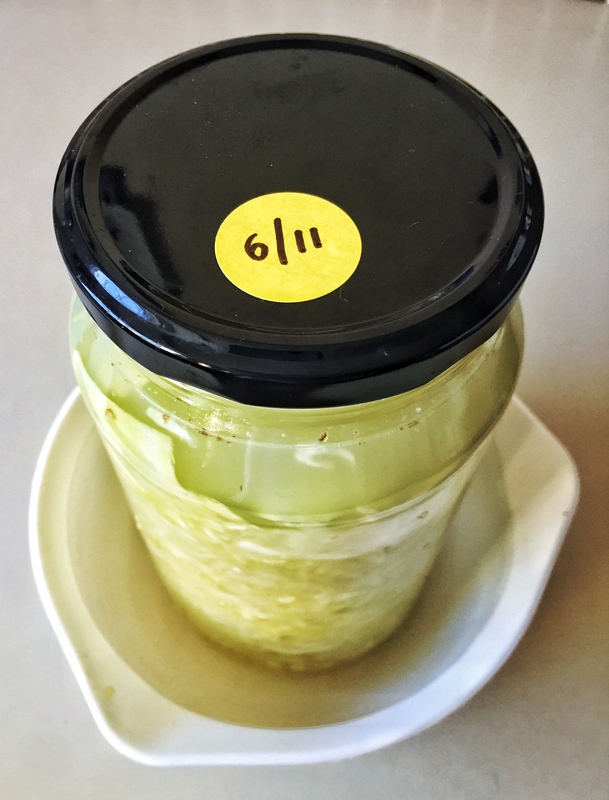 No doubt you’ve all heard by now how good fermented foods are for you, for your gut health, which science is now discovering plays an incredibly significant role in your overall health and wellbeing. So, Googling in my usual style, I discovered the basic elements for homemade sauerkraut. And they are cabbage and salt. Yep, that’s all folks. 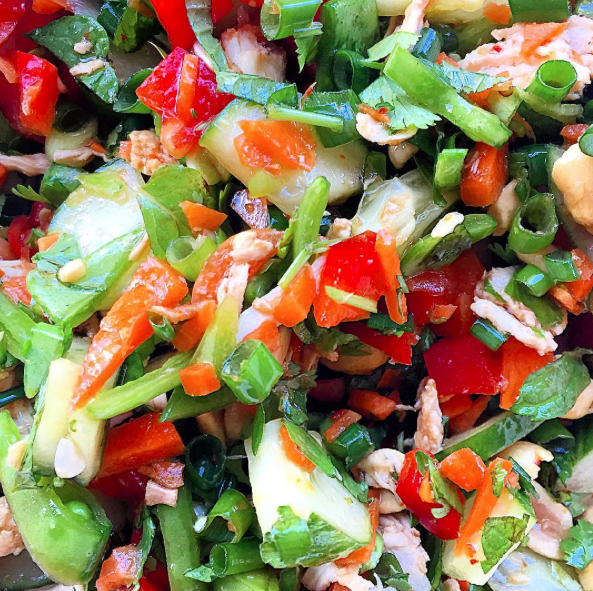 Of course you can add things in for variety and taste – like other veggies, herbs and spices, even extra probiotic cultures – but on the whole I usually stick with the basics. It’s ridiculously easy. The hardest part is waiting for it to become edible: waiting out the fermentation period. 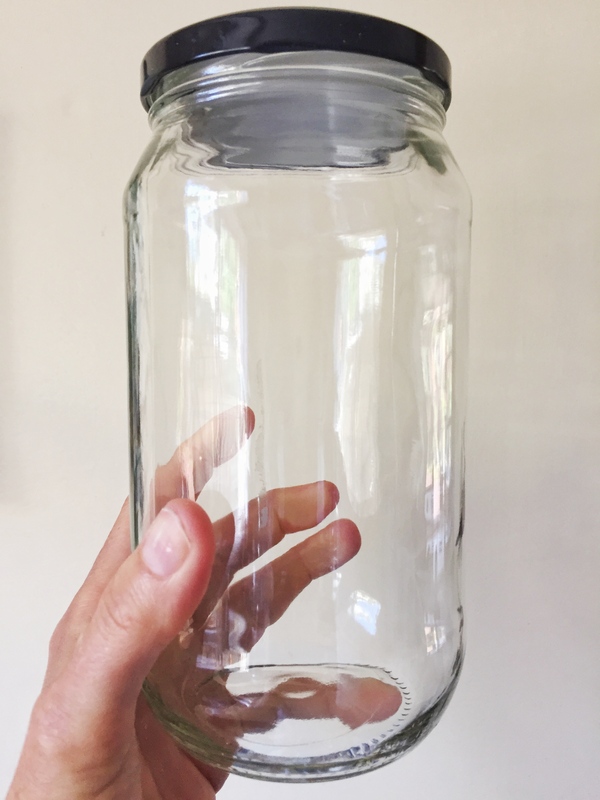 You can buy special equipment for the process (this can ensure better success) but I literally began with a 1 litre glass jar. An ex-coconut oil jar (pictured right). No frills whosoever. (Except that it had to have a mouth that I could fit my hand into; that’s imperative …you’ll see why.) 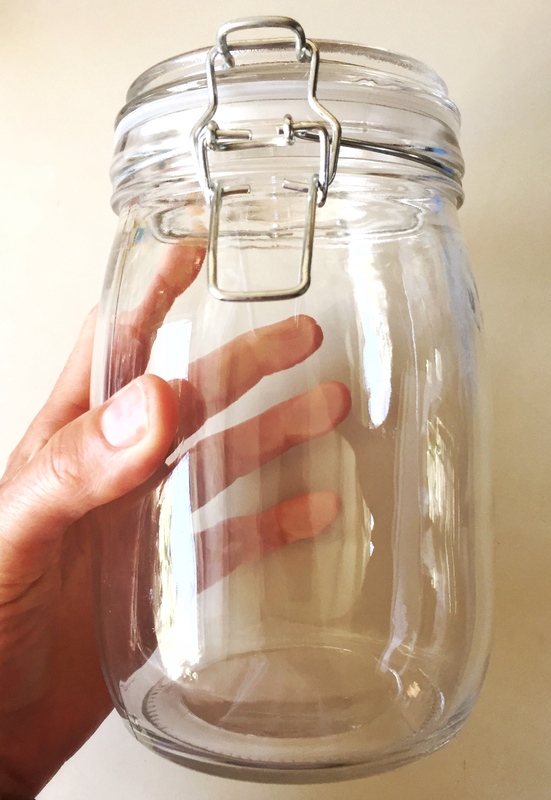 If, however, you end up liking and wanting to continue production after your first test batch, I’d highly recommend at the very least purchasing a jar with a proper rubber seal, such as the one pictured left. 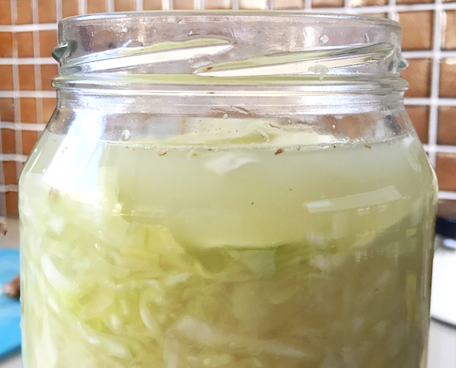 For a 1 litre container you’ll need 1kg of cabbage (about half of a large head) and 1 tablespoon of salt (I opt for Celtic sea or Himalayan for the higher trace mineral content). When I remember, I pop a bay leaf in too. Note: if you’re trying this for the first time and fear failure (don’t worry, I often do too) simply halve the amounts and the jar size. That way there’ll be less to throw out if (1) it fails or (2) you decide you don’t like it! Step One: Peel off some of the outer leaves of the cabbage and set them aside… don’t discard, we’ll be needing them later. Yes, ALL of this does eventually fit in that jar…and easily! Step Three: Add the salt (*and any other herbs or spices you’d like to include) and now you gotta git yer hands dirty! So make sure they’re clean. 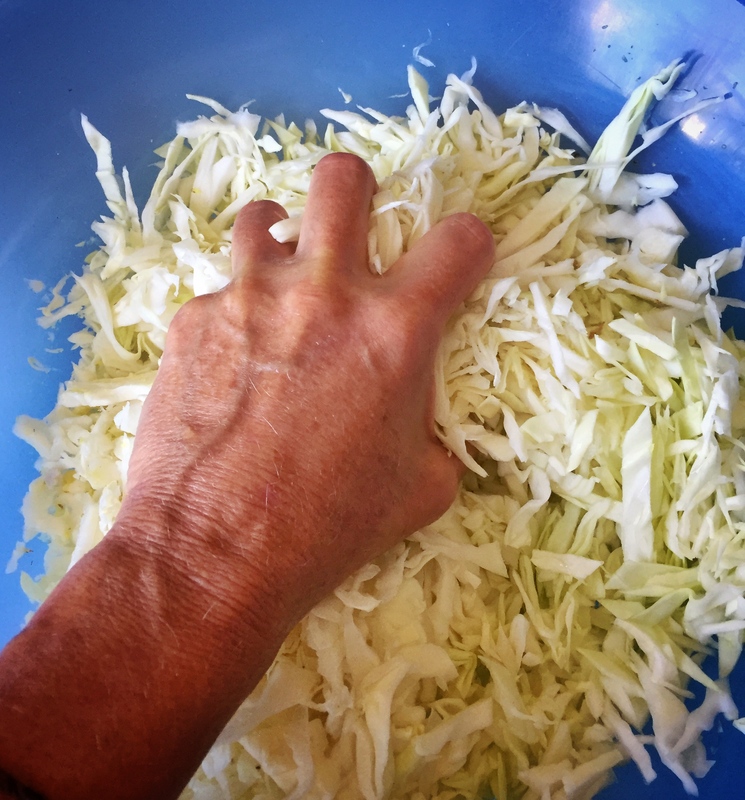 You need to get both hands into the bowl and massage the salt though the cabbage (et al). Really squeeze it, crush the life out of it! This is important to release the fluids (predominantly water) in the vegetable so that – combined with the salt you added – a brine can manifest. Give it a good couple of minutes… the longer, the better. Step Four: Let it rest. Wash your hands, set the timer for 15 minutes and go have a cuppa or something. The magic happens here: the salt continues to draw the fluid from the cabbage, increasing the amount of all-important brine. Step Five: Grab your jar and (with clean hands of course) begin stuffing the cabbage mixture in. 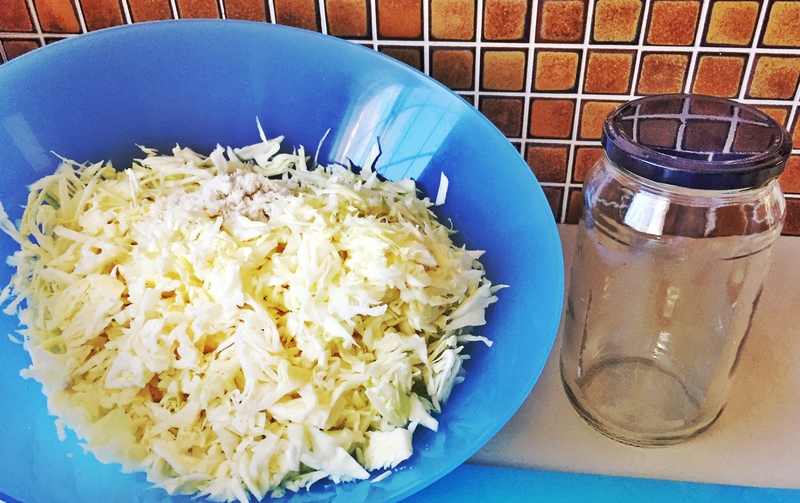 Take a break when you think it’s lookin’ kinda full and start squashing the cabbage down to the bottom of the jar. As hard as you can. You are squeezing out as much air as possible and you’ll probably notice all of a sudden the brine is coming to the top. Yeah! Keep going! Chuck more of that stuff in and keep pressing it down. Eventually you’ll reach the end and you should be lucky enough to have all of the mixture well below the level of brine. Step Seven: Date your creation (I pop little stickers on the lid, see pic below) and store for at least one week, maximum two, in a cool dark place (the back of the pantry is ideal). After one or two ‘explosive’ experiences (not really as scary as it sounds, just pressure build-up..) I decided to sit the jar in a little bowl just in case there’s a Great Brine Escape (leakage). When you’re ready to open it, discard the top cabbage leaves (and the excess brine if you like) and keep refrigerated. I’ve had opened jars in the fridge for up to 4 months! 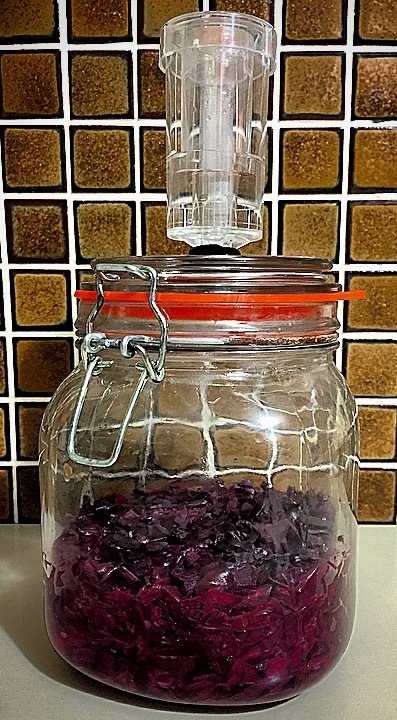 Now I must stress this is not the most hygienic way to make sauerkraut (as I said, there is proper equipment available out there in the marketplace) but of all the batches I’ve made (I’d guess nearly a dozen?) in the time I’ve been doing this, I’ve only had one batch that failed. And I knew it simply because it just didn’t smell right. Trust your nose, People. Science tells us there is no better apparatus to recognise bad food, than our own noses. There’s no question I’m a Sweet Tooth. For some reason, I usually want some dessert after dinner …even if I’m full. But it’s always a healthy option; usually fruit & nuts with yoghurt. This is basically a pimped up version of Strawberries & Cream: that was the original plan until I spotted the banana and the cogs began turning. The best thing about this is that the natural sugars in the overripe banana mean no added sugar is necessary in the cream. This dessert is super quick, easy and created from just four whole, natural ingredients. NB: I used a specific brand of cream that is naturally very thick (Maleny Dairies) so I can’t vouch for how well this may work for ordinary supermarket brand creams. All you need for a single serve is: approximately 2 tablespoons of cream, 1 small overripe banana, fresh strawberries and a handful of fresh blueberries. Finely chop the banana then simply mix vigorously with the cream, using a fork. (It might seem like a bit of work but using a blender could result in banana butter if you’re not careful. Besides, who wants to add a blender to the washing up?) Being overripe, the banana should break up pretty easily. Simply chop your strawberries, top with the ‘Banoffi’ mix, toss over the blueberries and devour. Deeeelicious!